This is a wonderful jam recipe taken from “salt sugar smoke” by Diana Henry. It makes 2 x 1lb jars of soft set jam. It is delicious either on buttered toast or added to a bowl of porridge for breakfast. Quarter the larger strawberries and combine with the passion fruit pulp and seeds. Add to a larger heavy-bottomed preserving pan with the lemon juice and sugar and heat until the sugar dissolves. Simmer for 5 minutes, then mash the strawberries. Bring to the boil and skim, then keep at rolling boil until the setting point is reached (104.5 degC). You’ll know when it’s done if you put a small portion on a chilled plate and it holds a wrinkled finish when you push it with your finger. Cool for 10 minutes then transfer to sterilised jars. Enjoy! I use a Viners stainless steel steamer pan for making jam but you can easily buy a jam pan, with a jam thermometer and jam funnel. The jars are 1lb (454g) Kilner jars with clip top lids. To sterilise the jars, wash them in very hot and soapy water and allow to dry. 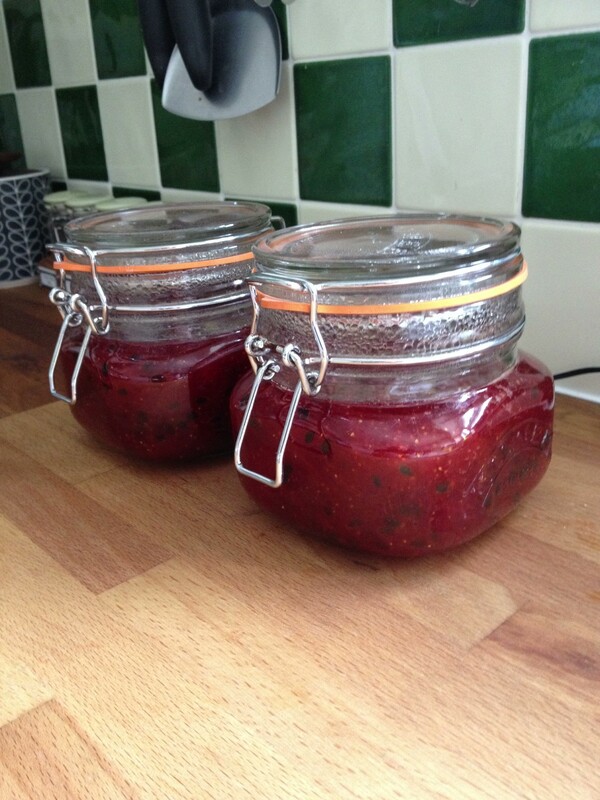 Heat in an oven at around 140 degC for 30 minutes, ideally whilst you’re starting to make your jam. Take care when handling the hot jars! To sterilise the rubber seals for the jars, place them in a pan of hot water and bring to the boil for a few minutes. Keep on a low simmer until you are ready to fill and seal the jars, then remove them carefully with tongs.